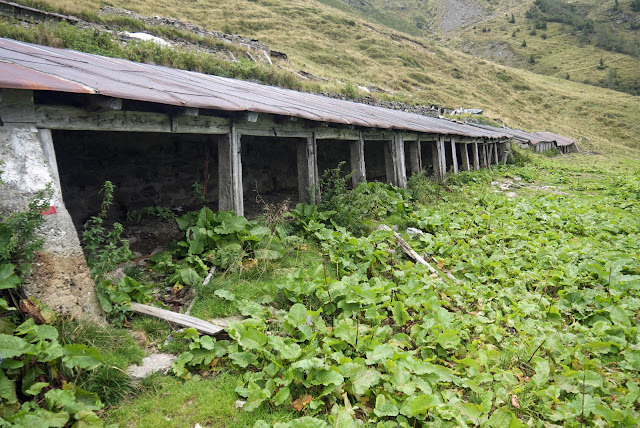 Christine doesn't like staying in huttes but accepts them as a necessary evil if you want to enjoy this style of walking. 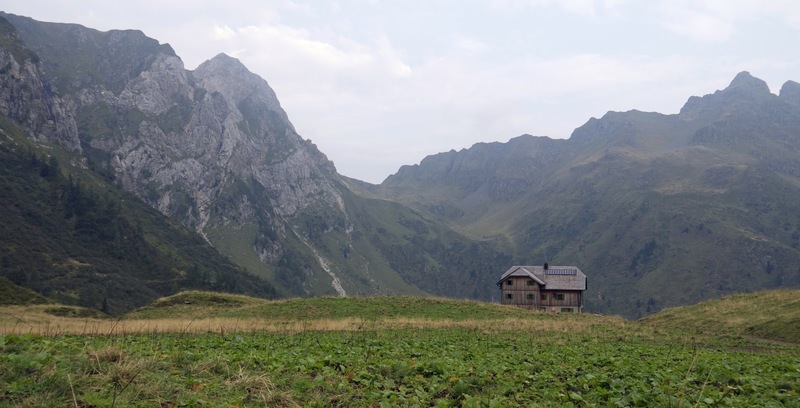 I had argued that the amazing locations, the sense of sharing the experience with other walkers, meant that the huttes added to the enjoyment of the holiday. Last night the balance of the argument shifted in Christine's favour. The hutte had all the positive aspects, location etc, and as usual we had managed to get one of the small rooms avoiding the large dormitory or 'lager'. Six berths, five occupied, three by us and two by a pair of German women, one on the large size. Got to sleep but Paul and Christine didn't because the large German woman was a monumental snorer. The volume of snore on each intake of breath was so loud that it soon woke me up. At first it was funny, we were actually laughing. Soon however the joke wore thin and Christine, starting with coughs and shuffles and exaggerated sighs was soon shouting abuse across the room. Nothing worked, Paul sensibly abandoned ship and decanted to a bunk on the landing, we just got crosser and crosser until eventually, hours later, the women stopped snoring and we finally fell asleep. Nothing said in the morning although I did notice that the second German woman had some very sophisticated ear plugs. The lack of sleep made the walking tougher. We are now into limestone country similar to the Dolomites, and the ridge walks have come to end. Today we had to climb over four passes with steep descents on the other sides. The first valley, on the Italian side of the first world war front line was particularly nice. We descended down an old military road through trees that were just starting to take on a feel of autumn. Signs of the war were everywhere with three sets of military barracks all quite well preserved. A lovely steady climb up to the Giramondo Pass, open grassland nearly all the way, and on the way up we overtook a 79 year old German who had left the hutte about 30 minutes before us, an amazingly fit man. The pass was the scene of great Italian bravery the details of which are described on information boards. 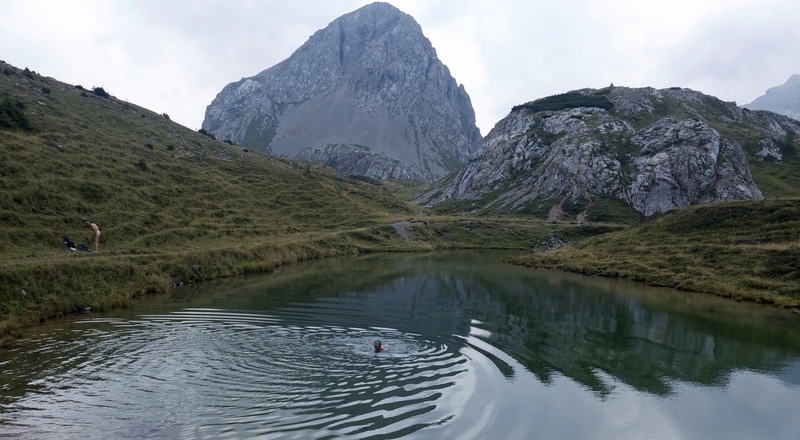 A more immediate act of bravery, or lunacy, was the decision by Christine and Paul to go swimming in a small alpine lake just below the pass. They were in for about 30 seconds but seemed very pleased with themselves. 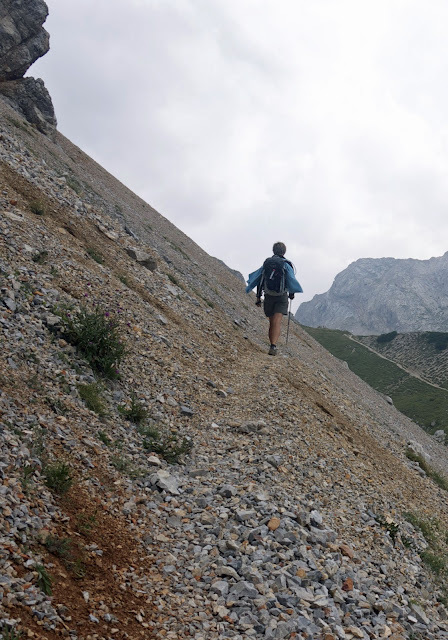 We then walked through some beautiful upland limestone scenery including a long stretch across scree. At the end of the scree another little stone told us that we were crossing the border from Italy to Austria. 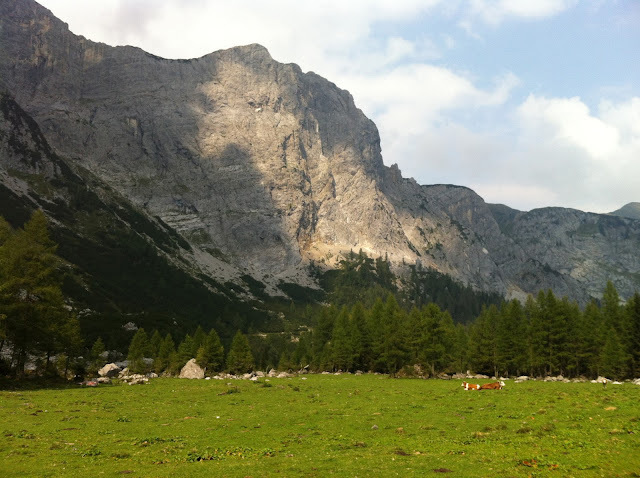 A savage 300 metre descent took us down to the Wolayer Alm, huge limestone cliffs everywhere and a herd of cattle grazing contentedly at the bottom. Wonderful scene. Wolayersee hutte. Brilliant location above a lake sandwiched between white and marbelised red limestone mountains. A sign told us the area was famous for fossils and a designated geo trail. 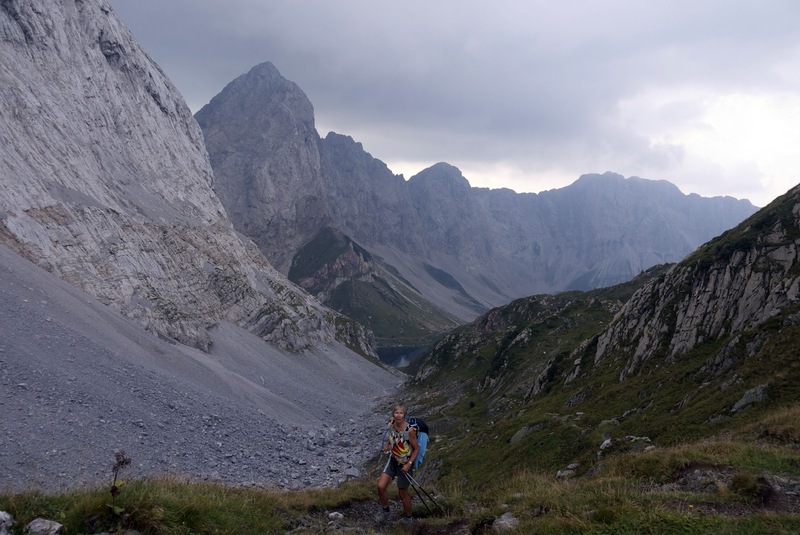 Final climb and another savage descent down to the Untere Valentinalm gasthof. No hutte tonight thank goodness. It rained hard just after we arrived, but today has been our first no waterproofs day in a week. My dodgy stomach has returned, which is a pain. Basically it's saying it can't stand anymore Austrian food.